Take a legendary Washington, DC Segway Tour with an exclusive guide dedicated to just your group. 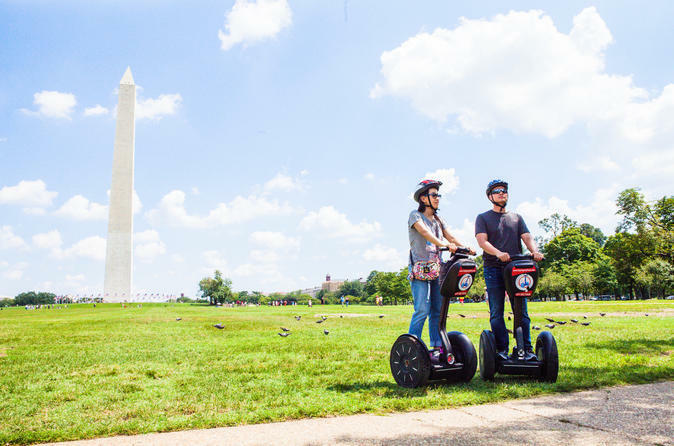 See the Nation's Capitol up close and personal from atop a Segway personal transporter as you glide effortlessly around the city. Your guide will begin the tour by discussing with you what you want to see on tour. Then, after a quick Segway orientation session, you'll be on the road taking in the city's highlights at your own pace! If you are looking for a little more exclusivity and flexibility with your Segway experience, check out our Small Group Private Segway Tours! With a tour guide dedicated just to your group, our private tours will let you see more and experience more without the distraction of outside guests. The tours last up to 2.5 hours including a short training session in the beginning to get everyone acclimated to the Segways. Once ready, your tour guide will lead you around the city showing you the sites that YOU want to see and going at your exact pace. Though our typical public Segway tours have only eight guests per tour guide, a small group private tour puts you in charge and allows you to enjoy the city just the way you want to see it. We've got some of the best and most fun tour guides around! On our Private Tours, you'll have a tour guide dedicated to just your group and making sure you get the most out of your Private Segway Experience. With small groups and a guide dedicated just to you, you can go at your own pace and see the sites that you want to see. Looking to just have fun on the Segway? No problem! Want a little more history with that? You got it! It's a Segway Experience the way you want it.